Steven Khalil dress worn once for my wedding in July 2018. Rendered in tulle with lace embroidery throughout, this Steven Khalil gown features an illusion neckline with long sleeves, a fitted bodice, and a ball gown skirt with a show stopper train creating the WOW impact of that dress. It has a Hidden zip back closure, the material is tulle, lace, and it is Fully lined. The dress is embellished with lace sleeves with sequins and sparkle with a slimming waistline and exquisite detail. This look is just perfect to make you feel like a queen on your special day. The gown has been professionally cleaned and in pristine condition. 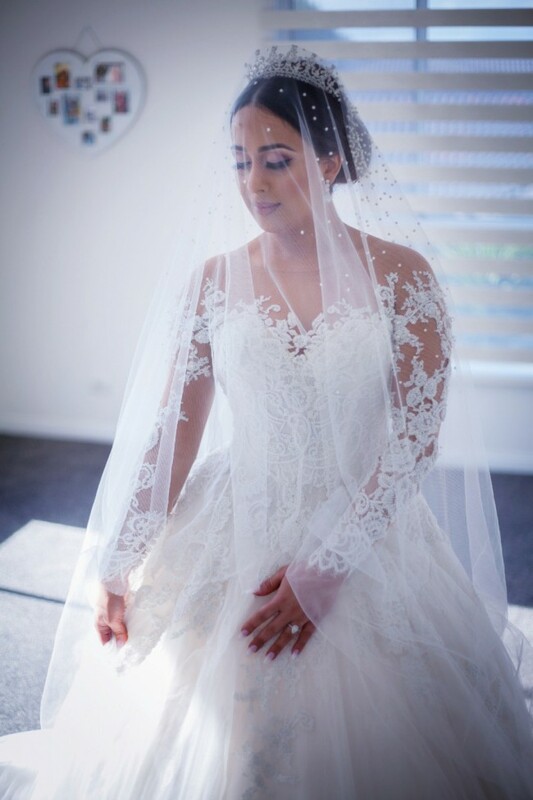 Selling with custom veil that has beautiful scattered pearls on it. Message me for inquiries if you want additional details and photos of the dress. Price is negotiable. Once you send a message, Hally can invite you to purchase the dress.